Major European nations have joined the United States in recognising Venezuelan opposition leader Juan Guaido as interim president, heightening a global showdown over Nicolas Maduro's socialist rule. The move by EU member states followed the expiry of an ultimatum for Mr Maduro to call a new election and aligned them with Washington against Russia and China. The sitting Venezuelan leader, accused of running thecountry like a dictatorship and wrecking its economy, has defied European heads of state and called them sycophants for following the US. Mr Guaido, who leads the National Assembly, declared himself caretaker leader last month in a move that has fed into a global geopolitical divide and brought Venezuelans onto the streets. 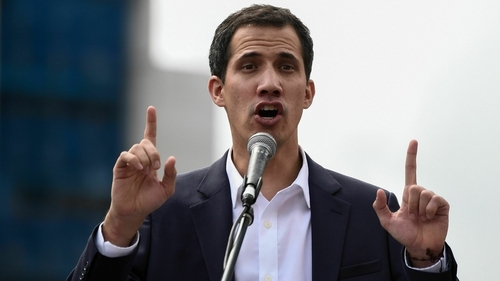 "From today, we will spare no effort in helping all Venezuelans achieve freedom, prosperity and harmony," Spanish Prime Minister Pedro Sanchez said, recognising Mr Guaido. Ireland has declined to recognise Mr Guaido specifically, though it does back the EU stance of calling for a fair election. The Department of Foreign Affairs here has said that Ireland will support European Union action after Mr Maduro rejected a call for snap elections. In a statement to RTÉ News, the department said that this includes "the issue of recognition of the country's leadership in line with article 233 of the Venezuela constitution." Mr Guaido cited this article to declare himself interim leader of Venezuela last month. The department said that it remains in close contact with EU colleagues to consider next steps in relation to the crisis in Venezuela. It said: "Ireland is committed to finding ways to foster shared democratic solutions that can bring political stability and address the pressing needs of the Venezuelan people, including by increasing EU humanitarian support". Who is Venezuela's self-appointed interim president? In response, Caracas has said it would revise relations with Europe, with Mr Maduro singling out "cowardly" Spain. "If one day there is a coup, if one day there is a gringo military intervention, your hands will be stained with blood, Mr Pedro Sanchez," he said in a speech. Mr Maduro, a former union leader, bus driver and foreign minister, has presided over an economic collapse and exodus of three million Venezuelans. He accuses Washington of waging "economic war" on Venezuela and harbouring coup pretensions aimed at gaining control over its oil. Venezuela's reserves are the largest in the world but production has plunged under Mr Maduro. "The oppression of the illegitimate, kleptocratic Maduro regime must end," said British Foreign Secretary Jeremy Hunt. Moscow and Beijing, which have poured billions of dollars of investment and loans into Venezuela, are supporting Mr Maduro and warning against foreign intervention. "Imposing some kind of decisions or trying to legitimise an attempt to usurp power is both direct and indirect interference," Kremlin spokesman Dmitry Peskov said. Mr Maduro won re-election last year, but critics say the vote was a sham. Two opposition rivals were barred, while food handouts to hungry Venezuelans were linked with political support. Italy, whose coalition government is divided over Venezuela, dissented from other European powers and blocked a joint statement saying individual nations had the prerogative to recognise Mr Guaido. Italy's 5-Star Movement says it cannot recognise self-appointed leaders. In addition to European pressure, a bloc of Latin American nations and Canada are to meet seeking to maintain pressure on Mr Maduro.